Each morning, two eggs, a bowl of fruit, a thermos of water, and a thermos of hot tea. Two pairs of spandex (now you know I’m not talking about myself), insulated coveralls, insulated steel-toe xtra-tuffs, four top layers, hat, scarf, and headband all donned with the lingering disdain for a morning woken up by an alarm. Always hoping for calm seas. Consistency. Just like her research. A Brittany Jones sighting on the boat can be rare. She exists, I promise, but her experiment and dedication to her work have unintentionally positioned her from the rest of the scientists that share common space for sediment and fisheries work. And when she does appear, it is often brief with an eye affixed to her watch or phone…always keeping to a schedule like the White Rabbit. When time allows, she is out on deck pitching in with the rest of the science crew, but the best place to find her is in one of the walk-in refrigerators, the very same where lettuce, carrots, and milk more commonly reside. Like one of Russ Hopcroft’s experiment (explained in an earlier blog post), Brittany is conducting several respirometry studies on benthic invertebrates. Her focus is on Macoma spp. and Serripes spp., two clam species that are found in the soft benthos of the Chukchi Sea. Clams in general are abundant in this region. Just ask graduate student Ann Zinkhann who, along with her fellow researchers, hauled in a weight-estimated 45,445 individual Nuculana radiata in a single bottom-trawl on the cruise! Dr. Sarah Hardy, one of the lead investigators for the Arctic Program sediment work, thinks that clams could be one of the primary consumers of carbon in the marine ecosystem. Brittany’s work will provide important information about how much energy a clam uses to survive, making it possible to figure out how many calories they might need to consume. Every 20 minutes for more than 15 hours, Brittany puts in her white earbuds, scrolls to a familiar Tim McGraw song on her phone, and ventures into her 0oC home away from home. No portholes. No chair. Space for only two people comfortably. Rows of glass vials line half the refrigerator space aft from the entrance. Each vial contains a pink spot glued on the inside, along with a single individual of Macoma or Serripes and filtrated seawater pressed to the top. A digital device lays to the side of the vials. It looks like an old mp3 player from the early 2000’s; big, bulky, and a digital readout that is too small for the size of the unit. The device can measure the oxygen concentration in the water and any changes to that percentage. Brittany explains that when a light is emitted by the fiber optic cable attached to the oxygen reader, the dynamic quenching of luminophores in a polymer matrix produces an interaction yielding percent oxygen concentration—in other words, “it’s magic,” explains Brittany. The latter I seem to comprehend far more than the former. In principle, as the clam consumes more oxygen, the percentage will go down and the rate of carbon dioxide will go up (i.e., respiration). With each measurement Brittany takes, she can later calculate the rate of respiration for these different species. To say that her experiment is novel is an understatement. Very few studies like this have ever been done in polar environments, much less on a ship in the middle of the Chukchi Sea. Brittany notes that some studies of this nature have been done in Antarctica, but much remains unknown about arctic clam respiration—including experimental design. Since the start of her PhD in January at the University of Alaska Fairbanks, College of Fisheries and Ocean Sciences, she has been tailoring her project specifically for Sikuliaq. She has come a long way from her undergraduate work at Gettysburg College, but it was research conducted there that led her to her first Arctic cruise in a refrigerator. 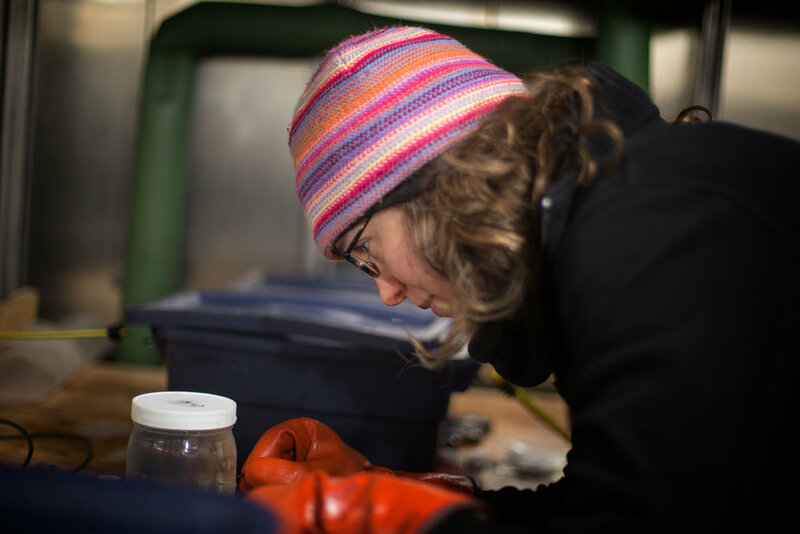 She studied mussel beds in Maine, and soon discovered that Maine wasn’t cold enough. How she ended up on the ship, “well, I googled Arctic benthic ecology, and Sarah’s work was the first thing that popped up.” An email later, and Brittany found a new advisor for her PhD work, Dr. Sarah Hardy. What Brittany did not know was how much time she was going to spend with her clams—so much so that if you walk into the ‘reefer unannounced, you may catch her humming the next George Strait song or even the casual conversation to her specimens. Clam gossip…apparently it’s a thing. In the refrigerator, Brittany looks at her watch. Time for another measurement. She takes the oxygen reader to the first of many samples and shines the green laser to the pink dot. “Please scan, please scan, please scan,” she thinks to herself because she knows that if the reader malfunctions (and it has on occasion) she has lost some of the very little free time she has to send a quick message to her boyfriend in Washington State. Despite the low bandwidth and lack of free time, she still sends a message to him—her home. Her day is cold; colder than any of ours on the ship. For most of the day she is isolated from the rest of the research crew like an engineer on a vessel as large as Sikuliaq. She’ll have you believe she’s not a morning person, and with a Groundhog’s Day research experiment like hers, you just might be convinced. However, if you can catch Brittany Flash Jones for a minute or two, she will share her smile and her laugh that will inevitably warm your heart albeit for an instant.